Although people in the month of September bring awareness to childhood obesity and ovarian cancer, they also bring awareness to sickle cell. This disease is not only found in African-Americans, but in other races as well. According to the Centers for Disease Control and Prevention, or CDC, sickle cell is found in people from Italy, India, Saudi Arabia, Turkey, Africa, South and Central America, Greece and Cuba. Red blood cells are important because they provide oxygen for the body. CDC said the word “sickle” comes from the way the red blood cells are shaped. Instead of being circular, the cells resemble “a farm tool called a ‘sickle.’” Regular blood cells travel through tiny blood vessels, whereas sickled blood cells cannot. As a result, the blood vessels are stopped up and the blood doesn’t flow properly. The Sickle Cell Disease Association of America, or SCDAA, lists a variety of problems that can occur because of sickle cell. Some of the problems include stroke, pain in the stomach, legs, chest and arms, acute chest syndrome and it can harm important organs. SCDAA said hydroxyurea is a medication used to treat sickle cell patients. It helps decrease pain episodes, acute chest syndrome and blood transfusions. Blood transfusions are needed because they can help reduce pain episodes and other issues that are created by the disease. Because sickle cell has affected about 100,000 people across the U.S., as said by SCDAA, many are bringing awareness. Born with sickle cell, Brittini Sumlin, 20, is bringing awareness through “Bold Lips for Sickle Cell.” She takes a photo of herself wearing lipstick, uploads the photo to any social media outlet and she challenges someone else to do the same. Her mother, Maya Sumlin, is participating, too. Sumlin also gives advice for those battling sickle cell like her. She said you should think about loved ones who make you happy. When she has a sickle cell episode, her newborn, Anais Sumlin, helps to ease the pain. Since sickle cell is painful, many are impacted during their daily lives. Sumlin has to wear more than one layer of clothing during the chilly seasons and she has to take her medicine with her everywhere she goes. 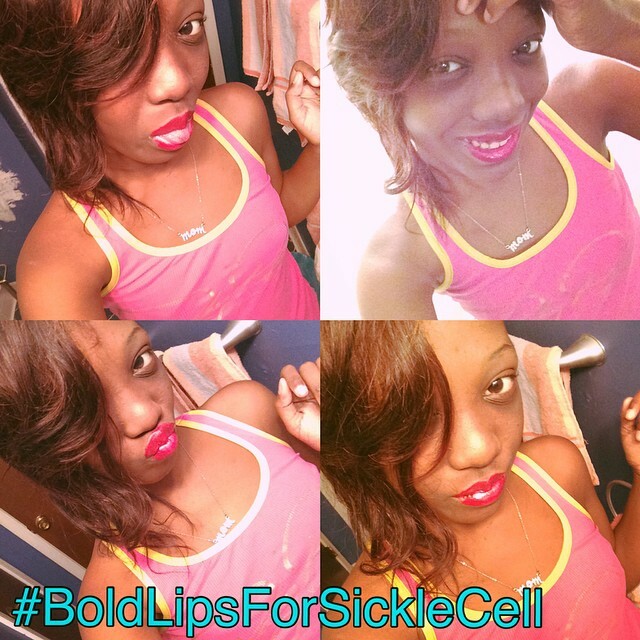 Sickle cell has also affected Brittini Sumlin’s mother. People have questioned Maya Sumlin about why she isn’t present at work and why her daughter is constantly sick. She’s even had speeding tickets for rushing her daughter to the hospital. Not to mention, she’s lost seven jobs. Even though it’s difficult watching her daughter struggle, Maya Sumlin continues to encourage her. With that said, as a challenge to you, put on your favorite brand of lipstick and pucker up to spread the word about sickle cell. For more information about this disease, go to sicklecelldisease.org and cdc.gov. This is a well written article by Ms. Matthews. We truly appreciate your help in raising awareness for Sickle Cell. Knowledge is power and I hope that the students of UWG understand the disease better and pass it forward to further educate others on thus debilitating disease. We thank you for your support. email subscription hyperlink or newsletter service. I may just subscribe. Thanks.